Kaelly is done and so I managed to get all SDE Minibosses finished before the Relic Knights SDE crossovers arrived. This marks the first time, that I’ve finished all currently available SDE Heroes, Bossed and Minibosses. I’ve started working on the Fireflow Denizens, but as I recently received a package with some new custom chibis from Velvet Mark, they will have to wait a bit longer to see some paint. 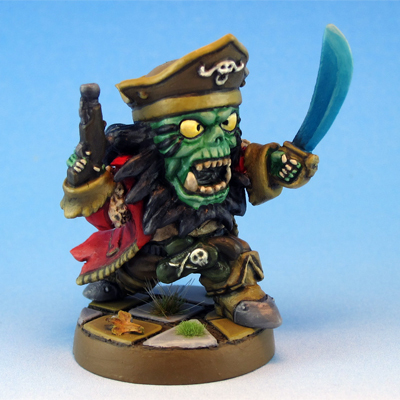 Finished another SDE Miniboss – Captain R. He reminds me a lot of LeChuck from the Monkey Island series, so I painted him up to look like LeChuck. My quest to finish up all SDE Bosses and Minibosses is not done yet. Shortly before I finished the Captain the new Miniboss Kaelly finally arrived at my local game store. She’ll be up next.